Home / Automotive / Cars / Taking Grandma For A Quick Hit In A Race Car, Reaction Is Priceless! 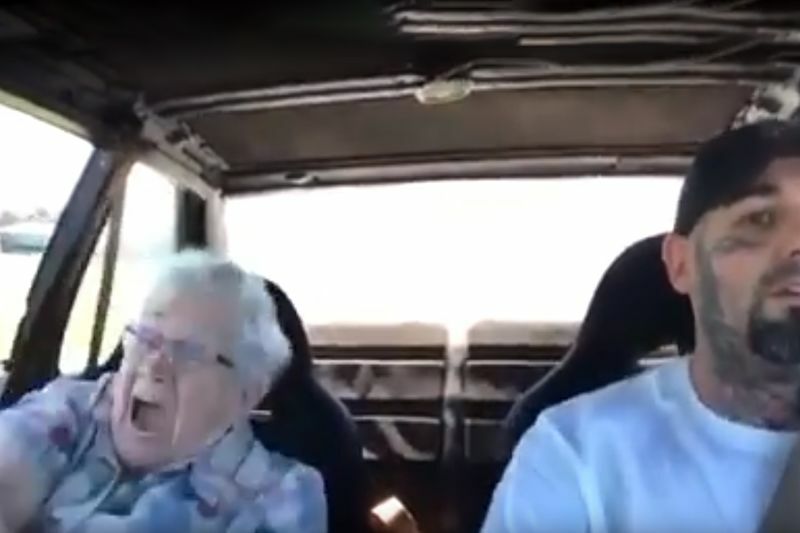 Grandma gets a quick hit in a race car and her reaction is priceless. As car enthusiasts, we sink plenty of time, effort, and hard-earned cash into our machines. Eventually, even though they might not be perfect, they result in something that we can be proud to say is our very own. Naturally, that’s something that you’re going to want to share with everyone, especially those that you love. This time, we show off a scenario that has a man and his grandma taking a ride in his wild ride and, just as we’ve come to expect, he’s got to lay into that long skinny pedal just a little bit to show her what it’s got – and probably scare the life out of her just a little bit along the way. Don’t worry though, it’s all in good fun at the end of the day and it looks like she ends up getting a kick out of it! In this one, we check out the reaction from grandma as she buckles up and tries to take on this beast as it hits the streets and her grandson lays into the throttle, showing her exactly what all of this power is about, her reaction is one that you’ve just got to see and absorb all for yourself. It looks like when this car can grab traction, that power is enough to push your brain to the back of your skull! It seems enough to make grandma’s eyes widen and pull out of her quite a reaction that you’ve got to love seeing with something like this. Check out the video below that shows this animal on four wheels that brings people together to witness exactly how all of that power feels in person. Car fanatic or not, you’ve got to love this genuine reaction as these two share in a moment that we bet they won’t soon forget. Video: Can You Drive A Road Legal Race Car Daily With No Windscreen? Underground Racing Tunes New Audi R8 V10 Plus To More Than 2,200 Hp!